When it comes to installing new windows or replacing the old ones, there is no dearth of options. The types of doors and windows in Kingston may differ greatly in material, size, feature and style. Each type of window is designed to serve a particular purpose within your home. And choosing the right type for the home heavily depends on understanding your personal preference for how you want that particular window to work for you. Here is a brief discussion on the most popular types of windows available. Single hung windows – This type of windows has two sashes hung vertically. Unlike double-hung version, with this type of window, only the bottom sash remains operational. It can be moved in upward direction while opening the window. Many companies manufacture operational sash for single-hung windows to tilt them in inward direction for simple and convenient cleaning of the exterior window pane. Double hung windows – As the name says, such windows feature two sashes hung vertically. Both the sashes remain operational, unlike single hung windows. The bottom sash can be moved upward while the top one moves downward to open the window and allow healthy ventilation. Many window brands manufacture double hung windows with sashes that easily tilt inward and thus allow for convenient cleaning of exterior panes. Sliding windows – This type of windows feature two to three sashes hung horizontally. The handy and functional design of such windows differs greatly by the brand. Some windows have two sashes with only one or both sliding horizontally while others feature three sashes with two outside sashes that slide to open. Centre sash always remains stationary. Tilt-out windows – Hopper windows, casement windows and awning windows – all of them are tilt-out windows. These are all single pane windows that open in outward direction. Such windows are usually operated with a handle to allow the window to open or close and get locked with one motion. Hopper windows feature a hinge along the bottom of the window and open in outward direction along the tip. Casement windows feature hinge on one side and that lets the window to open in an outward direction on the opposite side. Awning windows feature a single hinge along the top that helps the window to open outward at the bottom. 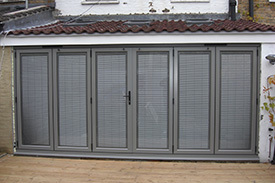 Bay and Bow windows – These windows are specifically designed to add some interesting architectural interests to a home. Bay windows consist of three windows positioned at sharp angles extending into outdoor. On the other hand, Bow windows consist of three or even more evenly sized windows placed side-by-side in a smooth and gentle curve extending into outside. Once you have made your mind about which type of windows you want to buy for your home, it is time that you select a reputed and reliable window installation contractor for installation of doors and windows in Sutton. If the windows are not properly installed, energy efficiency of the home may get severely disturbed. Longevity of the windows would also get negatively affected. So make sure you choose the right contractor for window installation only after checking their work history, certification, insurance, warranties etc. In this regards, know the benefits of selecting UPVC doors and windows for your home.